GLENDALE, ARIZONA --- Phoenix Coyotes General Manager Don Maloney announced today the Coyotes have signed unrestricted free agent goaltender Mike Smith to a multi-year contract. As per club policy, terms of the deal were not disclosed. In six NHL seasons with the Tampa Bay Lightning and the Dallas Stars, the 6-foot-4, 215 pound Smith has played in 162 NHL games, posting a 67-66-19 record with a 2.71 goals against average (GAA) and a .906 save percentage. Mike Smith. Photo by Getty Images. • Click here to listen to Smith field questions during a conference call with the media on Friday. Last season, Smith appeared in 22 games with the Tampa Bay Lightning posting a 13-6-1 record with one shutout, a 2.90 GAA and a .899 save percentage. 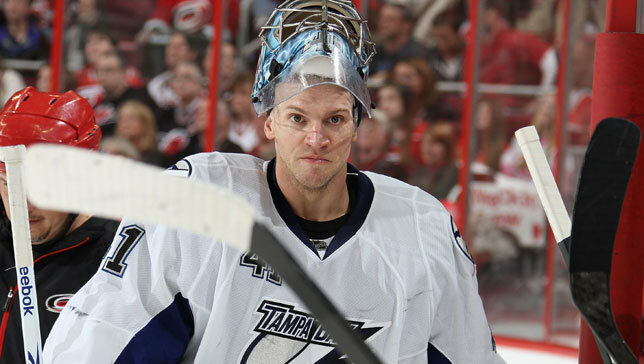 In three playoff games with the Lightning, he posted a 1-1 record with a 1.00 GAA and a .958 save percentage. In 2009-10, the 29-year-old native of Kingston, Ontario played in a career-high 42 games for Tampa Bay recording 13 wins. Smith was named the NHL’s Second Star of the Week on Jan. 4 after going 2-0-1 with a 1.31 GAA and a .957 save percentage. Smith played in 41 games with Tampa Bay in 2008-09, posting a 14-18-9 record, a .916 save percentage and a 2.62 GAA with 2 shutouts. He missed the final 32 games of the season with a concussion. Smith set career highs with 14 wins, 1,282 shots against, 1,174 saves, 2,471:21 minutes played and a .916 save percentage. He also made a career-high 42 saves on two occasions, Oct. 25 vs. San Jose and Oct. 11 vs. Carolina. Smith was originally drafted by the Dallas Stars in the fifth-round (161st overall) in the 2001 Entry Draft. He played two seasons with the Stars (2006-2008) before being acquired by Tampa Bay with Jussi Jokinen, Jeff Halpern and a fourth-round pick in 2009 in exchange for Brad Richards and Johan Holmqvist on Feb. 26, 2008. • Click here to listen to Coyotes Goaltending Coach Sean Burke answer questions about Smith.